Into the woods. How John James Audubon hunted, pinned, and painted his masterpiece, "The Birds of America." Everybody knows Audubon and his birds. The big, dramatic paintings and prints of the birds of America. Early America, when a man could look out a stagecoach window, or off a steamboat, and see birds to boggle the mind. When a buckskinned painter could, as Audubon did, just shoot them – easy as pie – and bring them home to pin up on the wall and paint. John James Audubon and his birds became American icons. But his story is a wild one. Born in Haiti. Raised in France. Broke in America until he found his calling, late. And then, by some, reviled. This hour, On Point: Audubon. Roberta Olson, curator of drawings at the New-York Historical Society. (Current exhibition.) Author of "Audubon's Aviary: the Original Watercolors for The Birds of America." Professor emeritus of art history at Wheaton College. 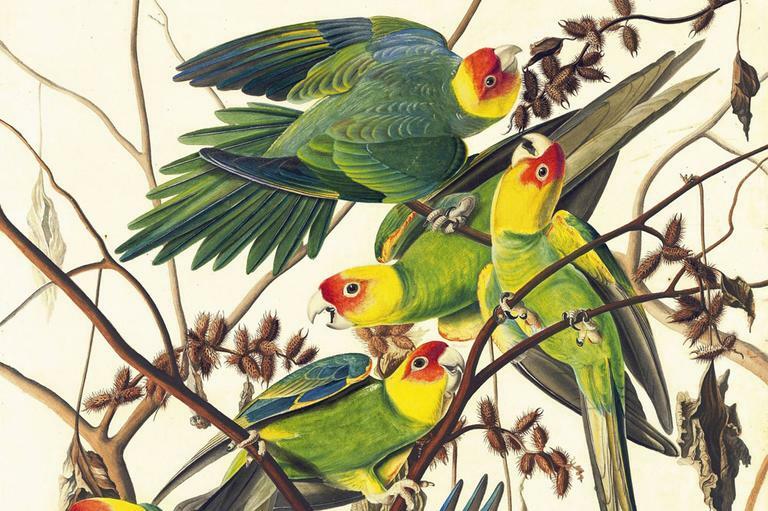 Wired "One little-appreciated aspect of Audubon's work is his technical virtuosity, said Olson. 'He'd stain, wet the pastels, put the watercolor on top of it, then outline every vein and barbule of a feather,' she said. 'For the Carolina parakeets, you get the idea of these birds calling out to you and flying in your face. When you turn the watercolor, they sparkle. They are alive.'" The New York Times "If John James Audubon had been less avian in his ambitions, he might have made a career as a portrait painter, which is how, on occasion, he supported himself while longing to paint birds and 'go in pursuit of those beautiful and happy creatures.'" This program airs on Invalid date.